The Afterschool Alliance, among others, has been very active in working to better define extended learning opportunities. They have published two excellent pieces which offer a framework for defining effective expanded learning principles. They have a longer document and also a one-pager that people can use when working on these concepts with stakeholders. 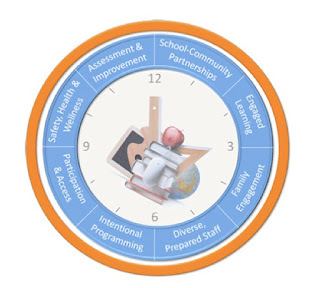 In a recent posting (March 9) on the Afterschool Alliance website entitled Recognition for Afterschool as a Learning Environment, author Erik Peterson cited the Learning in Afterschool & Summer (LIAS) project as doing an excellent job for defining engaged learning. He goes on to describe the five LIAS learning principles. Peterson ends the piece by stating "These [LIAS] principles serve as a great messaging piece to further spread the word that afterschool and summer learning programs are more than keeping young people safe. Organizations and individuals can sign-on in support of the Learning In Afterschool and Summer principles and help continue to make the case to policy makers that the engaged learning taking place in afterschool and summer learning programs contributes to student success."